It is our sunshine — our only sunshine. It makes us happy when skies are grey. Then it shoots us, but only because we dared love this $325, lighted, motion-sensing, sound producing Portal 2 turret replica too much. You'd have to love it too much, really. Maybe you already purchased Gaming Heads' original plain white Portal 2 turret replica, and it needs a friend. Maybe you just won a very small amount of money in the lottery and are feeling cocky. Perhaps you're just too lazy to look up turret sound effects on the internet, preferring some sort of 16 inch-tall statue that's limited to 250 pieces worldwide do it for you. Or you thought that laser was real and figured $325 was cheap for a real working laser. 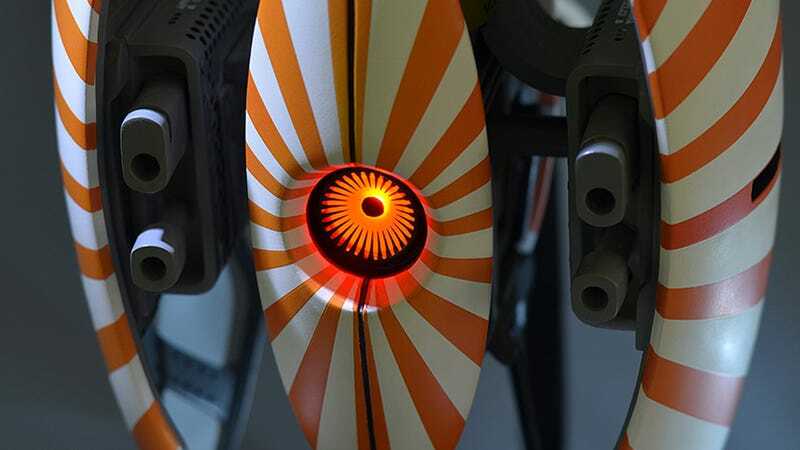 Whatever the case, if you preorder the Sunburst turret statue from Gaming Heads, you're pretty much sealing your fate. Don't worry — they'll be the happiest bullets through your internal organs ever.